At the end of the one-hour mark, the conversation with Tamim Iqbal turns to sacrifice. Many in Bangladesh will tell you that guys like Tamim don't really need to make sacrifices. He has an uncle who was a famous Bangladesh captain, and who then became a chief selector. He has a brother who played Test cricket before him. He comes from a family that is practically royalty in his home town, Chittagong. Tamim isn't the first player to be teased for having it all, not even the first from his family: his older brother Nafees Iqbal had to endure similar jibes. Yet lasting the course in international cricket isn't about wealth or family connections. Tamim took on the world as a teenage wonder, and after a decade of ups and downs, he has found his true self at the highest level. He might have been the first to bat when he was a little boy, but opening the batting is the toughest business in international cricket. Along the way there have been plenty of sacrifices. After his third tepid World Cup in 2015, he decided to cut down on food. "But when I see result coming in the field, I want to do more work off the field. I have come from a tour of 55-60 days, I am still doing my fitness work. I feel that this success isn't the end. If I want to compete with the top five batsmen in the world, this is the time when you put all your bad habits aside and try to achieve something." From the boy who was supposedly born with a silver spoon in his mouth, to the most trolled Bangladesh cricketer in recent memory, Tamim has seen just about everything. As he prepares to play his 50th Test, against Australia in Dhaka, he is already the highest run scorer in Bangladesh's Test and ODI history, and hungry to make up for all the lost runs in his career. Tamim Iqbal Khan was born the second child of Iqbal Khan and Nusrat Iqbal in 1989, and grew up in a joint family with his brother and sister, grandparents, uncles, aunts and cousins. When he was eight, he saw stardom from up close. Akram Khan, his uncle, became a folk hero after he led Bangladesh to qualification for the 1999 World Cup. At that young age Tamim had already shown his uncle glimpses of his prodigious talent. "Whenever I used to go back to Chittagong on a break from cricket, my brother [Iqbal Khan] used to arrange big programmes," Akram told ESPNcricinfo last year. "One time, he had one 'Tamim v Akram' match at the indoor stadium. At that time Tamim was eight or nine years old. I remember he beat me in that single-wicket competition, much to everyone's surprise. That kid hit me for a six." In this respect Tamim was in keeping with Chittagong's tradition of strong and skilled batsmen, exemplified by Akram and Minhajul Abedin, two of Bangladesh's best batsmen in the days before Test status. Chittagong remains a batsman's paradise, as seen in the pitches at its Test venues, the MA Aziz Stadium and the Zahur Ahmed Chowdhury Stadium, and in training sessions around the city. Like Akram, Tamim's brother Nafees went from Chittagong to Dhaka, and led Bangladesh's age-group teams. Yet whenever you asked Akram about Nafees, he would always finish by saying: "…but watch out for Tamim. You know, Nafees' younger brother. He is going to blow you away. Just wait for him to grow up." As a young boy Tamim enjoyed playing with his father in the outer ground of the MA Aziz Stadium, a stone's throw away from their home. He played his first cricket-ball match for Shatodol club at nine, and was soon picked up for national age-group sides. Training camps held at the country's biggest sports institute, Bangladesh Krira Shikkha Protisthan (BKSP) in Savar, near Dhaka, weren't easy for Tamim. He had never lived away from home, but he learned to adapt to the hostel-style lives of his friends and fellow BKSP students Shakib Al Hasan and Mushfiqur Rahim. In 2006, when Nafees was dropped from the national team after 27 games, it was an early lesson for Tamim. Patience ran out quickly among selectors for openers those days, and they had run through 21 in seven years. Less than a year after Nafees played his last Test, Tamim made his international debut. In a way, the selectors had got to him as they tried to find a replacement for Nafees. If Tamim was to stick around, he knew he would have to make his opportunity count. In his fifth ODI innings, in Bangladesh's first game of the 2007 World Cup, Tamim burst through India. His 53-ball 51 contained charged sixes off Zaheer Khan and Munaf Patel and set the tone for an astonishingly easy upset win in Port-of-Spain. It was a breakthrough performance for Bangladesh, yet it took Tamim another 12 innings for his next fifty. "We weren't a great team at the time," he remembers. "We used to celebrate on small successes back in 2007. I scored a fifty playing some exciting shots, and it made me a star in Bangladesh. But now, the same wouldn't have happened. Now Bangladeshi players make hundreds regularly. "I broke into the international scene but I also realised quickly that I needed to get a hell of a lot better. The moment I became known, other teams started to mark me and plan for me. I didn't have too many shots at the time, and there were a lot of weak points in my batting." Whenever you asked Akram about Nafees, he would always finish off with this sentence: "… but watch out for Tamim. You know, Nafees' younger brother"
Towards the end of 2007, Australia's Jamie Siddons came on as Bangladesh coach. Tamim says that Siddons made a radical change to the Bangladesh team's training approach. He himself spent hours in the nets with the coach, indoor and outdoor, ironing out his chinks. "Under Jamie Siddons, I developed as a batsman between 2007 and 2010," he says. "We always thought that working hard was doing gym, running, and improving fitness. Jamie changed that; he said that working hard isn't just about running five or ten kilometres or spending hours in the gym. He taught us that working hard can be in batting too. "If a batsman goes to the nets and bowling machine, and starts playing cover drive or on the pads, it is easy practice. When a batsman tries to tackle deliveries in the rib area, that's working hard. He changed this within us. We have a saying that you can't get the result of hard work instantly. You get it after some time. Jamie was unlucky in the sense that he did all the hard work but didn't get to taste the success." For Tamim, though, the results began to show. In July 2009 he scored his maiden Test hundred, even if it was against an under-strength West Indies. A month later his 154 took Bangladesh to their first-ever successful 300-plus chase in ODIs. This was the start of a purple patch that lasted an entire year: he struck 151 against India in Dhaka, nearly scored a century in the first session against England, again in Dhaka, then followed it up with Test centuries at Lord's and Old Trafford, made all that much sweeter as it came on the back of Geoffrey Boycott's criticism and a sledge by Kevin Pietersen during the Chittagong Test earlier that year ("Cricket is so easy for you, right? You go to Old Trafford, then you will see."). He was just 21 years old. The Test hundreds in England made a real star out of Tamim. Within the next few months, he was appointed vice-captain to Shakib for the 2011 World Cup. The tournament, however, didn't go to plan. Crushing defeats to India, West Indies and South Africa saw the co-hosts Bangladesh make an early exit. Series defeats to Australia and Zimbabwe soon after prompted the board to strip Shakib and Tamim of their duties. Stuart Law replaced Siddons as coach. Cricket, and life, was about to get much tougher for Tamim. Tamim charges Devendra Bishoo's tossed-up, slightly wide delivery and edges the booming drive; he falls for 83, disrupting Bangladesh's quest for final day survival in the second Test against West Indies in October 2011. Against Pakistan at home the following month, he scores just 59 runs in two Tests, and 0, 4 and 0 in the ODI series. At the start one of those matches, as the teams line up to shake hands with the dignitaries, the BCB chief AHM Mustafa Kamal touches Tamim on the knee that he had been complaining about the previous few days. It is later heard that the BCB chief wasn't entirely convinced about Tamim's injury, and thus the gesture. Kamal's discontent with Tamim's fitness boils over when he omits him from the 2012 Asia Cup team. Akram Khan, the chief selector and Tamim's uncle, quits his post; the country's prime minister intervenes to reinstate both Akram and Tamim. As much as the Bangladesh dressing room tries to play down the controversy, everybody knows it will blow away only if Tamim makes runs. Otherwise, Tamim knows that it is he who will be gone. "I still remember that on the morning of the first match against Pakistan," says Tamim of that Asia Cup. "I swear I was shaking. I am not just saying because this is an interview, but I was literally shaking. It took me 16  balls to score my first run in that game. I can promise you that if I hadn't scored in that game, you wouldn't have seen me for a long time. I was very lucky. God was very kind to me that I scored." A normally calm presence under the helmet, Tamim says he is at his worst when waiting to bat. "If I have scored a hundred in the last match, then waiting to go out to bat, I feel I have never batted in a game of cricket. I start to get fidgety. 'Why isn't the umpire going out? Why are we still in the dressing room?' This happened to me a lot in that Asia Cup." Tamim scored four fifties in four matches in that tournament. When he reached the fourth of those, in the final against Pakistan, he celebrated with an elaborate 1-2-3-4, counting off the fifties on his fingers. Tamim says that the gesture wasn't towards Kamal or anyone else in power, just for the dressing room. "I know what you're thinking," he says. "Everyone thought that I was showing it to one individual. If I wanted to show it to him, I would have raised my hand a bit higher. It was for my team-mates. I never meant it for him." He interjects the sentence with a smile. Tension rose at Adelaide Oval with England needing 20 runs off 15 balls to stay alive in the 2015 World Cup. Chris Woakes cracked Taskin Ahmed to the long-on boundary, where the ball burst through Tamim's reverse cup: dropped. Mashrafe Mortaza looked concerned. As captain, he had spent many evenings during the tournament to bring Tamim out of his mental rut after a series of low scores that had prompted ridicule back home. He was afraid to contemplate what the public back home would do to Tamim if Bangladesh went on to lose the game. As it happened, Rubel Hossain, once a flat-mate of Tamim, took two late wickets to give Bangladesh a ten-run win - and a berth in the knockouts. Bangladesh went no further than the quarter-final, and Tamim's third World Cup campaign was as lukewarm as his first two. But he took home one great lesson. "I took fitness very seriously [after the 2015 World Cup]," he says. "When you are carrying eight-ten kilos fewer in your back, you can do a lot of things that you didn't do before. When I started playing cricket, I batted for hours. I have changed all those things. Now I bat for 20-25 minutes with a purpose. "I have spoken to many legends across the world. Greg Chappell told me that I don't need to bat for hours to get results. I need to bat with purpose, which is more important. Our coach [Chandika Hathurusingha] says the same thing. I have changed small things. I think I have started to believe in myself from before." That belief has been contagious. Shortly after that World Cup, Tamim knocked off hundreds in consecutive ODIs against Pakistan; after Soumya Sarkar blasted a hundred in the third game, he said that much of his confidence came from watching Tamim in the first two. In that same series Tamim made his maiden Test double-century, in Khulna, after Pakistan had taken a 296-run first-innings lead. Bangladesh are known to capitulate in the face of such totals, and this time it was made doubly hard as Imrul Kayes, Tamim's opening partner, had to put on the batting pads after keeping wicket for 80-odd overs as a replacement for the injured Mushfiqur Rahim. Tamim vowed to bat normally, and the belief transferred to Imrul, who had just come off a woeful World Cup campaign. The 312-run opening stand between the two was a world record for the second innings, breaking the one set by Colin Cowdrey and Geoff Pullar in 1960. "The moment we started to get a hang of the bowlers and the wicket, we just enjoyed our batting," Tamim says. "It would have been difficult to survive if we had another mentality. We went with the flow, and did whatever we wanted." Bangladesh saved the match. The double-century was proof that Tamim was not just talking the talk but walking the walk. After all, in team meetings he had been telling his younger team-mates all about responsibility and batting past milestones. "If I am telling the younger ones in the meeting to make their starts count, I need to do it myself too. I may be making the same mistakes but I am trying to minimise it as much as possible." His team-mates, like Mashrafe, who was by his side in the dark days of the 2015 World Cup, marvelled at Tamim's progress. It was not just the runs that Mashrafe was proud of. He was particularly happy that Tamim wasn't taking the trolls too seriously. In the past Tamim got mad at every taunt, but he seemed to have moved past that. According to people close to Tamim, his marriage in 2013, and then fatherhood in 2016, have made him a more stable person. He is extremely protective of his family. In July this year, he abruptly left Essex with his wife and son, after playing just one match in the NatWest Blast. The decision to fly back home was believed to be the result of a racially motivated incident. Tamim denied that it was, but it is understood that he did so in order to deflect any unnecessary attention on his family. He is a private man who likes to stay away from the spotlight, and enjoys vacationing more than anyone else in the Bangladesh team. The BCB president Nazmul Hassan likes to tell the story of Tamim Iqbal approaching a hundred, against Afghanistan in October 2016. As he crossed 85, Prime Minister Sheikh Hasina ignored a pile of paperwork on her desk, as well as her lunch. As soon as he reached the milestone, she thanked the Almighty and returned to her papers. Cricket is not Bangladesh's national sport but it has pride of place in the country's consciousness. It is what football is to Brazil and Argentina. In the 2000s, this feeling was apparent after every single win, and in the last three years after every series win. A victory in cricket is one of the few things that unifies a nation of 163 million. Tamim has seen the power of cricket from several vantage points - from atop his uncle Akram's shoulders in 1997, and since 2007 as an integral member of the Bangladesh team. Tamim says that the Bangladesh team now believes in itself, something it used to say to itself before but without true conviction. "Whenever a new coach would come, they asked us in the first meeting what we want to achieve in the next few years. We used to say that we want to be among the top five teams in the world and all that. When we used to say it, I am sure we wanted to, but there was also a doubt in our minds because of the way we were playing then. Now that we are achieving those things, it gives us a different kind of feeling. When other nine nations are respecting you more than before, it is a different kind of feeling. Before the game, nobody can now tell you that Bangladesh is going to lose this match." Tamim's sublime match-winning 104 against England on a difficult pitch in Dhaka last October showed how far he, and Bangladesh, had come. An even better example was Bangladesh's 100th Test match, this March at the P Sara Oval. Tamim's fourth-innings 82 against Sri Lanka on a crumbling pitch set up Bangladesh's series-levelling victory. His runs came with audacious drives - on the up, inside-out - and yet it was also a defensive masterpiece. Rangana Herath, the fourth-innings king, had taken two early wickets and whizzed deliveries past outside edges with alarming frequency. Tamim was watchful, until he saw that the inexperienced Sabbir Rahman was comfortable enough to play the reverse sweep. Tamim understood then that he didn't just have to preserve his wicket, he could also play his own attacking game. "We used to celebrate on small successes back in 2007. I scored a fifty playing some exciting shots, and it made me a star in Bangladesh. But now, the same wouldn't have happened. Now Bangladeshi players make hundreds regularly"
"The hundred against England was on a difficult wicket but still, I batted first. It was an important innings but I would keep the 82 above," Tamim says. "I was batting on a fifth-day wicket, and we lost two wickets very quickly. Normally Bangladesh's history shows that we could have collapsed. The way I and Sabbir batted in that innings was what we should always do in similar situations." While many thought that the Bangladesh players' heavy schedule in recent times would expose their fitness, Tamim felt it has been an advantage to the batsmen. "I have repeatedly said in the past that we don't play enough cricket," he says. "I think we had the busiest ten-month period in the last 15 years. A batsman in form usually benefits during such a time. As a team too, I won't say it was a fantastic ten months, but it was an interesting one. We won some games but we also should have won some more." 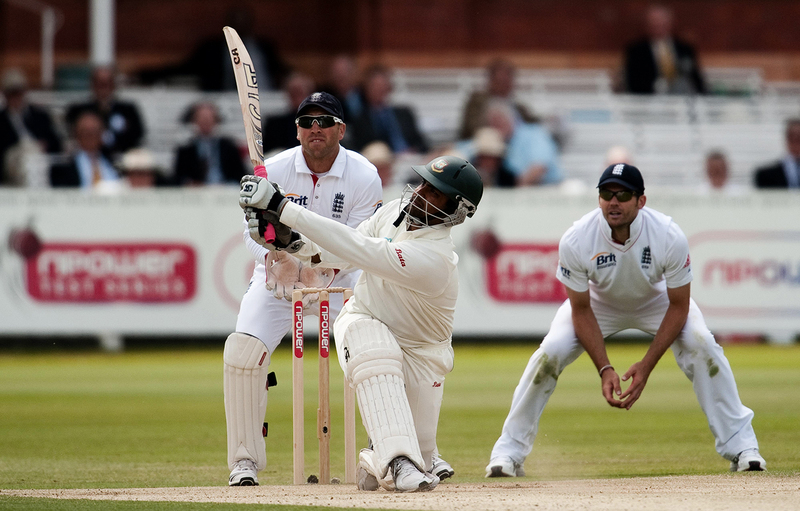 One of the things he knows Bangladesh batsmen need to work on is dealing with the short ball. Tamim himself faced a bruising battle against Australia in the Champions Trophy, but feels that his tackling of it must have given the younger batsmen confidence. "Nobody enjoys facing short balls, but I don't mind facing them. I have my shots and I can score runs off pull shots. This is one area that normally the bowling attacks try to target Bangladeshi batsmen. New Zealand and England tried it recently in the Champions Trophy, but we managed to win one game and score 300-plus in the other. It shows we are getting better at it. It is a matter of how mentally tough you are to handle it." Tamim had a glorious Champions Trophy, and was selected in the ICC's tournament XI, as well as ESPNcricinfo's. Yet Bangladesh's semi-final exit gave the players a taste of the work ahead of them. Tamim is a determined man. "We need to leave a legacy by doing something special. Bangladesh cricket has invested ten years on us," he says. "This is our time to give it back to them. Previously we used to talk about experience and how we don't play enough. These things are all gone now. "Five [four] of us have played over 150 ODIs. We are playing cricket quite regularly - maybe not Tests but ODIs. If we can set a benchmark for the youngsters to follow, they won't need as much time as we took. They will do things 50 matches ahead of the time we took." Until that time, Bangladesh will continue to depend on a fidgety Tamim Iqbal sitting in the dressing room, waiting for the umpires and the fielders to get going. He will rush onto the field, not caring whether his opening partner is beside him or far behind. He will take strike, just as he would do as a kid on hot afternoons in the outer stadium in Chittagong, with his dad acting as umpire. Whether he is considered blue-blooded or bloody-minded, he will continue to set the mood of the nation, from the first ball.